Just a few notes on how I modify & reconfigure TP-Link WR703N's to run OpenWRT as a home server/node. These are a really tiny, ultra-cheap (~$25), Chinese "3G travel router", using an Atheros AR7240 400MHz ARM CPU with just 4Mb flash & 32Mb RAM. They come with chinese firmware that needs to be replaced with a suitable english alternative. For general server use, I reflash them with the OpenWRT linux variant designed for small device use, and use an 8Gb USB drive as extroot, as I believe this is the most flexible and configurable alternative. There is also a version of the TP-Link firmware, written for the close cousin (and slightly more expensive) MR3020 (which is available from Australian suppliers, and likely a good choice if you actually want its default functionality). first step is to purchase one of these beastie's, just look on eBay, currently available for <A$25 from china or hong kong. They are also available from some online Australian suppliers (for likely a little more). You should also get a low-profile 4-8GB USB drive (I'm using a Sandisk Cruzer Fit) to use as a much larger external file system. 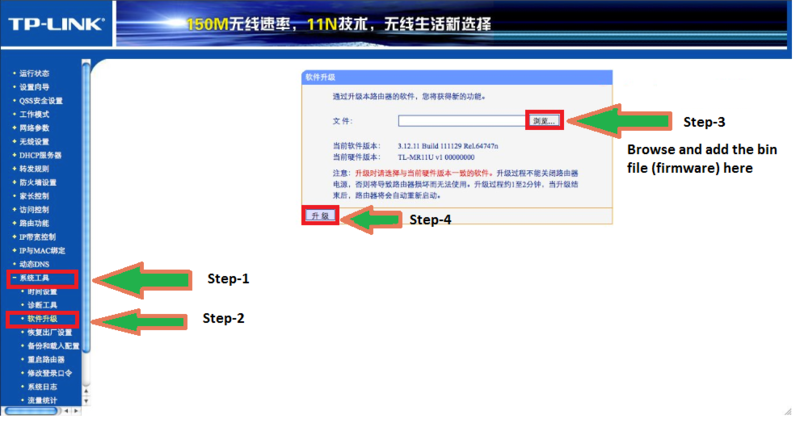 once have items, must first replace chinese firmware with OpenWRT, see refs , , . connect the wr703n directly to your config host (eg. linux laptop) following instructions , ,  to access it and do the firmware upgrade. In brief, this means booting the device whilst connected to a standalone system on network 192.168.1/24, login with password admin, and select the system upgrade option, as shown in this figure. once rebooted into OpenWRT do initial net & system config so device can be placed on your home LAN (likely with fixed IP). You can either use the ssh command-line, or the Luci web management interface for this. the Luci web interface (should be installed with uhttpd webserver & lua scripting language by default) provides a quite nice interface for standard queries & config, just enable & start uhttpd, see . Likewise if you are going to expose the SSH port externally, I suggest you use a non-standard external port, configure SSH public key authentication for root, and disable root password login (though make *very* sure the public key login works first, or you'll be in trouble!) This is because there is continuous extensive scanning of SSH ports for weak passwords on known logins (like root), and you just don't want this load on the box! You may want to spend some time reviewing and thinking about your network interface/firewall configuration (which initially I found very confusing). Specifically note the distinction between logical firewall zones (that define different trust regions for the firewall rules - by default you have a trusted inside "lan" and untrusted natted outside "wan"); and physical network interfaces that your assign IP config to and allocate to a firewall zone. I now have 3 "generic" configs in use: static local ethernet for plugged into home LAN; access point that clients can connect to which connects via ethernet with DHCP for wan; and local client that connects to the local net wirelessly (with nat for ethernet clients). If you want to configure your device as a WiFi access point, you likely want to add a third logical "WiFi" zone and suitable rules for traffic relay between this and likely existing wan zone, similar to lan-wan rules. and note that if you get into trouble whilst adding/configuring assorted extensions, all these changes are now being made on the USB extroot; you can alway reboot the system sans USB drive, and will be back to your original, minimal pre-extroot (you *did* make sure that was working didn't you!) configuration - you can plug the USB drive back in after booting, where it will now just be a normal mount (likely on /mnt) where you can fiddle/reset files to hopefully restore things. Clearly the packages added depends on what you want a specific system to do. if you want the original "travel router" functionality of this device, and especially if you want to use a "mobile broadband" 3G/4G connection, then you are likely best off using the official TP-Link MR3020 firmware.